Made of heavy duty PVC fabric, suitable for group activities and games. A perfect activity game for school children to learn the fruits while improving their memory and understanding skills, by matching 15 different fruits. Set of 1pc Mat (Size : 1 m x 1.2 m), 2 Cards each of 15 full colour printed fruits with their names. Comes with a storage bag. Made of heavy duty PVC fabric, suitable for group activities and games. A perfect activity game for school children to learn the animals while improving their memory and understanding skills, by matching 15 different animals. 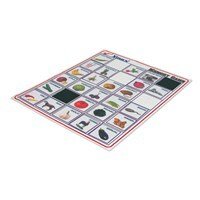 Set of 1pc Mat (Size : 1 m x 1.2 m), 2 Cards each of 15 full colour printed animals with their names. Comes with a storage bag. 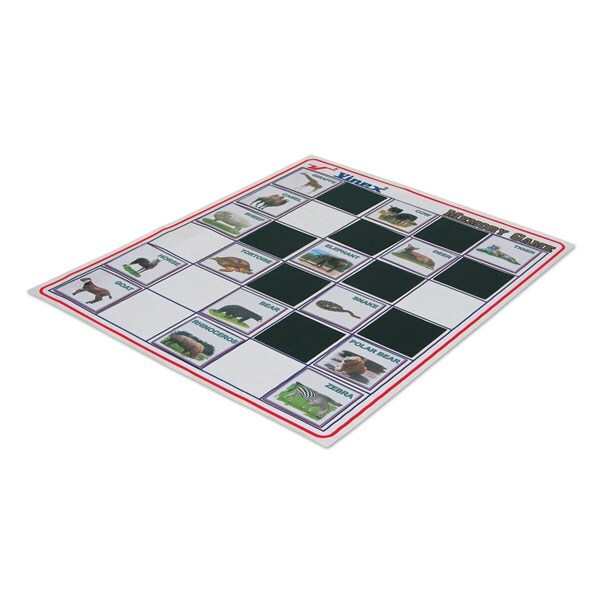 Made of heavy duty PVC fabric, suitable for group activities and games. A perfect activity game for school children to learn the vegetables while improving their memory and understanding skills, by matching 15 different vegetables. Set of 1pc Mat (Size : 1 m x 1.2 m), 2 Cards each of 15 full colour printed vegetables with their names. Comes with a storage bag. Made of heavy duty PVC fabric, suitable for bigger group activities, events or games. Available in 2 variants. Variant - 1 : Set of 1pc Mat (Size: 1 m x 1.2 m), 30 Printed Cards (2 cards each of 5 different vegetables, 5 different fruits and 5 different animals with their names). Comes with a carry bag. Variant - 2 : Set of 1pc Mat (Size: 3 m x 3.6 m) for displaying 120 Cards, Printed Cards (4 cards each of 10 different vegetables, 10 different fruits and 10 different animals with their names). Comes with a carry bag.